Inner Rambling of a Mid Life Mama. : There is light... at the end of the dark, dark tunnel. There is light... at the end of the dark, dark tunnel. 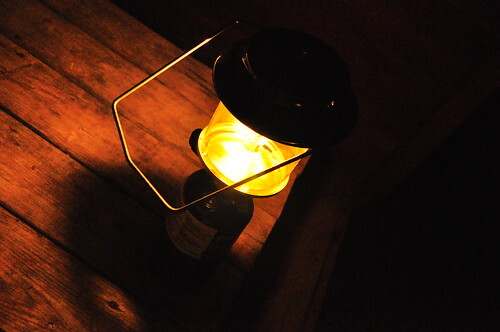 Camping lantern, originally uploaded by McGillicutty1. Someone very near and dear to me is going through what I can only describe as sheer hell at this time... well for a while now actually. I would not wish this type of misfortune and anguish on anyone, not even the vilest of characters. She's a pillar of strength and a beautiful soul, I can't imagine anything worse than being thrust into circumstances beyond your control and feeling that helplessness as you struggle to figure out an escape. I rack my brains for solutions and tiny pearls of wisdom to offer comfort at this time but just keep coming up empty. I feel inadequate as a comfort and find myself hurting for her on a regular basis. It's just a horrible and heart wrenching situation that can't be rationalized no matter how hard you ponder, analyze or break it down, and believe me I have tried all of the above. I'm not a good at having no solutions, after all for every problem there is an answer, there has to be, otherwise how do we go on? How does she go on? what choice does she have? Every day is another blank page, a day filled with opportunity, that's what I believe. One day will be her day, her opportunity, her golden ray of sunshine when she's released from all this purgatory into a life of love and happiness, peace and security. The lamp is my gift to her... a symbol so that she can hold on to the knowledge that there is a light at the end of the darkness, it's not a tunnel, it's complete and utter all encompassing darkness, but the light will come. I'm holding out hope with everything I have. So my friend... I'm on your side... I don't always have words to comfort you but I'm using all I have to support you from my corner, this light will soon be yours. I'm sure that just having you there for her is a great comfort. And that you care so much means a lot to her. You are a great friend. beautiful post... all is not lost. she has a friend like you that can hold up the light for her.